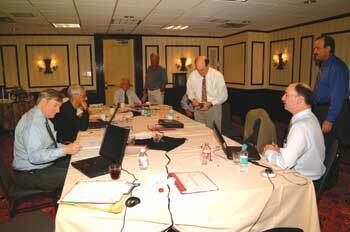 Your APSF Executive Committee at work reviewing and planning safety initiatives. The 2006 Annual Meeting of the American Society of Anesthesiologists will be held at McCormick Place in Chicago, Illinois, from Saturday, October 14, 2006, through Wednesday, October 18, 2006. Patient safety will once again play a significant role in the numerous lectures, presentations, and scientific topics integral to this annual conference. The ever popular Refresher Course Lectures will begin on Saturday, October 14, and continue daily throughout the meeting, beginning with Dr. Jan Ehrenwerth reminding us of Fire in the Operating Room: It Could Happen to You (#108, 10:50-11:40 am, Room E271). Following this hot topic, in the same room, are Dr. William Rosenblatt presenting Decision Making in Airway Management (#109, 1:40-2:30 pm), and Dr. Jessica Alexander pointing out The Potential Hazards of Perioperative Herb and Dietary Supplement Use (#110, 2:50-3:40 pm). In Room E350, Dr. Evan Kharasch will break down Issues in Anesthetic Degradation and Toxicity (#113, 9:40-10:30 am). Airway topics resurface in Room E351 as Dr. Andranik Ovassapian explores The Role of LMA, Combitube and Fiberoptics in the Difficult Airway (#120, 10:50-11:40 am). Dr. James Cottrell presents his thinking on Perioperative Neuroprotection for the High Risk Surgical Patient in Room E352 (#129, 4:00-4:50 pm), while Dr. Mark Warner simultaneously sheds light on Neuropathies, Blindness and Positioning Problems in Room E353b (#135). Dr. Arnold Berry awakens new perspectives with Our Health and the Safety of Our Patients in a 24/7 World: Are we Asleep on the Job? (#136, 8:30-9:20 am). Sunday afternoon brings us the opportunity to hear Dr. Robert Caplan’s ever popular discussion of the ASA Closed Claims Project: Lessons Learned (#217, 2:50-3:40 pm, Room E350), presented concurrently with Dr. Carin Hagberg refreshing the important topic of Current Concepts in the Management of the Difficult Airway (#235, Room E353b). Dr. John Eichhorn shares his expertise regarding Risk Management in Anesthesia Practice in Room E353c (#240, 1:40-2:30 pm). On Monday, October 16, Dr. Jerrold Levy starts the morning off with Anaphylaxis and Adverse Drug Reactions (#310, 8:30-9:20 am, Room E351), and Dr. Tempelhoff follows that afternoon with advice toward Avoiding Complications in Neuroanesthesia (#311, beginning at 1:40 pm, Room E351). The emerging topic of Inflammatory Response: Current Concepts will be presented by Dr. Edward Sherwood (#316, 2:50-3:40 pm, Room E352). Tuesday, October 17 revives us with Raising the Dead: Management of the Post-Arrest Patient presented by Dr. Grenda Fahy (#402, 9:40-10:30 am, Room E271). During this same time slot, in Room E351, Dr. Steve Hall will review The Child With a Difficult Airway: Recognition and Management (#412). That afternoon several practical and important safety topics will be presented including, Dr. Girish Joshi discussing The Patient With Sleep Apnea Syndrome for Ambulatory Surgery (#414, 2:50-3:40 pm, Room E351), Dr. Daniel Cole delving into Depth of Anesthesia: Clinical Applications, Awareness and Beyond (#418, 1:40-2:30 pm, Room E352), Dr. Michael Murray Managing Mass Casualties (#423, 2:50-3:40 pm, Room E353b), and Dr. Alan Tait helping us by Minimizing and Managing Infections in the Perioperative Period: The Role of the Anesthesiologist (#427, 1:40-2:30 pm, Room E353c). Room E450b is host to Dr. Frederic Berry reminding of us of What to do After an Adverse Outcome (#432, 1:40-2:30 pm) and Dr. Jonathan Benumof explaining The New ASA OSA Guidelines (#433, 2:50-3:40 pm). The ASA Refresher Courses conclude on Wednesday, October 18, 2006, with Dr. Lucinda Everett reviewing Safety and Quality in Ambulatory Anesthesia (#501, 8:30-9:20 am, Room E353b), followed in the same room by Dr. Jeanine Wiener-Kronish exploring the question Infection Control for the Anesthesiologist: Is There More than Handwashing? (#502, 9:40-10:30 am), and Dr. Barbara Leighton topping things off with Epidural Analgesia for Labor: Safety and Success (#503, 10:50-11:40 am). This ASA meeting’s Scientific Papers (Oral Presentations, Poster Discussions, and Posters) include 7 sessions that focus on patient safety. Leading off will be a Poster session moderated by Dr. Daniel Sessler, set for 9:00-11:00 am, Saturday, October 14, in Hall E, Area E. Topics in this session encompass postoperative outcomes ranging from PONV to mortality. Two examples to illustrate the group of posters dealing with PONV include Multiple Agent Antiemetic Prophylaxis for the Prevention of Early and Late PONV: Is It Effective? (A-127) presented by Dr. Jerome O’Hara’s group of the Cleveland Clinic Foundation, and Does Supplemental Intraoperative Oxygen Reduce the Incidence of PONV after Gynecologic Laparoscopy? (A-129) from Dr. Freda Richa and colleagues at the Hotel-Dieu de France Hospital, Beirut, Ashrafieh, Lebanon. Reducing medication errors is the focus of several presentations in this session, including Prospective Assessment of a New Anesthetic Drug Administration System Designed To Improve Safety (A-138) presented by Dr. Alan Merry’s team from the University of Auckland, New Zealand, and A Retrospective Analysis of Anesthesia-Related Medication Errors at a Tertiary Medical Center (A-139) offered by Dr. Gregory Applegate and his group from Case Western Reserve University and the University Hospitals of Cleveland. Mortality outcomes are the issue for Dr. Kazuo Irita’s group, from the Japanese Society of Anesthesiologists, in their presentation Deaths on the Operating Table in Japan (A-135), and for Drs. Yvon Bryan and Thomas Taghon of the Cincinnati Children’s Hospital Medical Center in One in Ten Million: Fatalities Involving MRI (A-145). Also, a team from the Albert Einstein College of Medicine in the Bronx, New York, offers 2 posters on structured peer review as a means for analyzing adverse perioperative outcomes (first authors in parentheses): Structured Peer Review and the Quality Management Template —A Multi-Institutional Analysis (A-136, Dr. Vilma Joseph) and Adverse Outcomes and Human Errors in a System of Structured Peer Review (A-146, Dr. Rhoda Levine). An Oral Presentation session, moderated by Dr. Michael Smith, takes place from 9:00-10:30 am, Sunday, October 15, in Room N230b. This session will deal with safety issues related to orthopedic anesthesia. Dr. Boris Mraovic and colleagues from Thomas Jefferson University in Philadelphia will begin with Glucose Management in Orthopedic Surgery Patients (A-381). Following will be a presentation on Factors Associated with 6 Months Mortality in 488 Patients after Surgery of Femoral Neck Fractures (A-382), led by Dr. Philipp Honigmann and his team from Kantonsspital Lucerne, Switzerland. Dr. John Murkin and colleagues from the University of Western Ontario will present Safety Evaluation of Aprotinin from a New, Large, Multicenter Study in Primary Total Hip Arthroplasty (A-383). Other presentations in this session will include Allergic Reactions Due to Aprotinin—A Prospective Study in 1,307 Orthopedic Surgery Patients (A-384) by Dr. Guenter Singbartl’s group from the ENDO-Klinik, Hamburg, Germany; Non-Viral Disease Complications in the Cost-Utility Analysis of Cell Salvage Blood (A-385) by Dr. Dale Szpisjak from the Uniformed Services University of Health Sciences, Bethesda, Maryland; and Post-Operative Hypoxia Risks in Patients with Patient Controlled Analgesia after Joint Replacement (A-386) from Dr. Michael Williams and his team, also at Thomas Jefferson University. Internal jugular vein cannulation, various monitoring advances, ventilation, and microbial control are but a few of the subjects to be presented in another patient safety-oriented Poster session, set for 9:00-11:00 am, Monday, October 16, in Hall E, Area F, with Dr. Warren Sandberg as moderator. Two posters will address safety in internal jugular vein cannulation: Dr. Q.I. Li and colleagues from the West China Hospital of Sichuan University will report on Monitoring of Vascular Pressure and Waveform Helps To Indicate Inadvertent Carotid Arterial Puncture (A-926); Dr. Masato Morita’s team from Nagoya City University in Japan will present The Skin-Traction Method Can Increase Cross-Sectional Area of Internal Jugular Vein (A-927). Two posters from a Medical College of Wisconsin team will advance the discussion on preventing desiccated CO2 absorbents, a recent topic in the APSF Newsletter. These include Sevoflurane Breakdown Produces Flammable Hydrogen Gas (A-928, Dr. Marshall Dunning), and Sodasorb® LF Inhibits Sevoflurane and Desflurane Degradation without Loss of CO2 Absorption Efficacy (A-930, Dr. Harvey Woehlck). Several posters evaluate new monitoring equipment, including one by Dr. Musa Sesay and colleagues from Pellegrin University Hospital, Bordeaux, France, which reports on the Audibility of Anesthesia Alarms during MRI: Evaluation of the PARAPAC™, the CONTINUUM® and MAGLIFE™ (A-925). Among the posters dealing with ventilation, Dr. Steven Cnudde’s Belgium group considers Are Ventilators with an American or an European Breathing Bag Safe To Prevent Accidental Volutrauma? (A-932). Drs. Julie Lajoie and Elizabeth Ling of McMaster University, Hamilton, Ontario, assess How Clean Are We? Determining Microbial Growth on Commonly Touched Items in Three Operating Rooms (A-944). Also on Monday, from 2:00-3:30 pm in Room N426a, Dr. Richard Prielipp will moderate a Poster Discussion session centered on the risks of obesity and obstructive sleep apnea. Four sessions will concern obesity: Dr. Ashish Sinha’s group from the University of Pennsylvania will present Evaluating a Risk Assessment Tool in Morbidly Obese Patients Undergoing Gastric Bypass Surgery (A-987); Dr. James Blum and his team from the University of Michigan will consider both The Risk of Quality Assurance Events in 116,035 Patients Based on Body Mass Index (A-989) and The Risk of NSQIP Postoperative Complications with Increasing BMI (A-990); Dr. Lois Connolly and colleagues from the Medical College of Wisconsin will address how Increases in Body Mass Index Correlate to Increasing Perioperative Event (A-992). Four other presentations investigate sleep apnea. Three of those come from a University of Toronto team: Should Surgical Patients with Difficult Intubation Be Referred to Sleep Clinic for Polysomnography? (A-986, Dr. Frances Chung); What Is the Best Preop Screening Tool for Surgical Patients with Obstructive Sleep Apnea (OSA)? (A-991, Dr. Chung); and OSA Questionnaire: A New Short-Form Screening Tool for Obstructive Sleep Apnea (OSA) Patients (A-993, Dr. Balaji Yegneswaran). Also, Dr. Kevin Finkel’s group from Washington University in St. Louis will present Obstructive Sleep Apnea: The Silent Pandemic (A-988). Another Poster session, moderated by Dr. Dexter Franklin, is scheduled for 9:00-11:00 am, Tuesday, October 17, in Hall E, Area D. Here the majority of posters will analyze patient flow through the OR system. While patient safety is implicitly central to this topic, a number of posters in this session stand out for specifically addressing safety-related concerns in the OR and other clinic settings. For example, Drs. Paul Barach and Jonathan Wilverding of the University of Miami explore a standardized "hand-off" system for transferring patients between hospital areas, such as from the ER to the ICU, in Assessing and Improving Communication of Patient Care Information in Critical Care Settings (A-1291). Drs. Jon Halling and Alexander Gutkin of the Ochsner Clinic Foundation in New Orleans, in One Hospital’s Response to a Mass Disaster —Lessons and Thoughts (A-1304), summarize the response of that institution, and particularly their Department of Anesthesiology to Hurricane Katrina, including preplanning, disaster management, a discussion of areas for improvement down the road, and the status of the recovery of the healthcare infrastructure in New Orleans. Also in this session, Dr. Thierry Girard and colleagues from the University of Basel, Switzerland, address the present and future of testing for malignant hyperthermia in Can We Improve on Phenotyping for Malignant Hyperthermia? (A-1309) and How Accurate Is Testing for Malignant Hyperthermia? (A-1310). Safety in electronic medical records will be the theme of a Poster Discussion session set for 1:30-3:00 pm on Tuesday, October 17, in Room N426a, with Dr. Robert Johnstone moderating. Two reports from Dr. Michael Vigoda and colleagues from the University of Miami highlight beta blockade issues: Anesthesia Information System Shows Inadequate Intraoperative Beta Blockade in Patients with CAD (A-1376) and Intraoperative Beta Blocker Use Doesn’t Change with Electronic Reminder of Patients’ Cardiac Status (A-1377). Dr. Fabian Kooij and his team from the Onze Lieve Vrouwe Gasthuis/Academical Medical Center, Amsterdam, Netherlands, will present Decision Support System Increases Data Quality on Preoperative Record (A-1378). "Risky Business" in the OR: A Survey of Anesthesia Information System Policy Decisions (A-1379) is the topic for Dr. Richard Epstein’s group from Jefferson Medical College. Dr. Alfred Pinchak and his team from CWRU-Metrohealth Medical Center in Cleveland, Ohio, will report on Automating the Analysis of Physiological Data from Computerized Anesthesia Records (A-1380). Antibiotic administration is the issue in 2 presentations: a Vanderbilt team lead by Dr. Paul St. Jacques will examine the Effect of an Automated Antibiotic Prompt as Part of an Integrated Perioperative Informatics System (A-1381); Improved Compliance with Antibiotic Guidelines with Implementation of an Electronic Visual Reminder (A-1382) will be presented by Dr. David Wax’s group from the Mount Sinai School of Medicine in New York. Dr. Warren Sandberg and colleagues from Massachusetts General Hospital in Boston will offer recommendations for Improving Documentation Quality with Automated Anesthesia Information Management (A-1383). Airway management issues predominate in a Poster session scheduled for 9:00-11:00 am, Wednesday, October 18, in Hall E, Area E, and moderated by Dr. Joan Christie. A sampling of posters on that topic includes one by Dr. Anne-Marie Cros and her group from the Pellegrin University Hospital, Bordeaux, France, titled Prospective Study of Complications, Incidence and Predictive Factors of Difficult Mask Ventilation (A-1687). Dr. Mohammad Maroof and his team from the University of North Carolina at Chapel Hill will discuss how the Ambu Laryngeal Mask Is a Better Alternative to Tracheal Extubation as Compared to LMA Classic (A-1688). Dr. Masami Yamazato and colleagues from the University of the Ryukyus in Okinawa, Japan, will present Bronchofiber-View Assist Nasotracheal Intubation Technique Can Dramatically Reduce Nasal Trauma (A-1696). Dr. Jong Seok Lee and his group at Yonsei University College of Medicine in Seoul, Korea, report a case of Hypoglossal Nerve Injury Following the Use of the CobraPLA®(A-1698). Rounding out this session is a miscellany of posters on such subjects as acute intraoperative events and sedation. These include The Effect of Intramedullary Decompression in Preventing Bone Marrow Embolism during THA (A-1679) delivered by Dr. Masaki Takashina and colleagues from Osaka University Hospital, Japan, and a Retrospective Evaluation of Efficacy and Safety of Emergency Room Sedation in Pediatric Patients (A-1695) from Dr. Tricia Meyer’s team of the Scott and White Healthcare System, Temple, Texas. This year’s annual ASA Meeting promises to be an exciting series of lectures, presentations, and discussions replete with information, ideas, and food for thought. Patient safety again plays a major role. Please check out the ASA website and meeting program for a complete list of topics and schedules. Dr. Somerville is a Research Administrative Coordinator in the Department of Public Health Sciences at Wake Forest University School of Medicine. Dr. Morell is the Editor of this publication, Clinical Associate Professor of Anesthesiology, Wake Forest University School of Medicine, Adjunct Clinical Associate Professor of Anesthesiology, University of Florida, and a private practice anesthesiologist living in Niceville, FL.